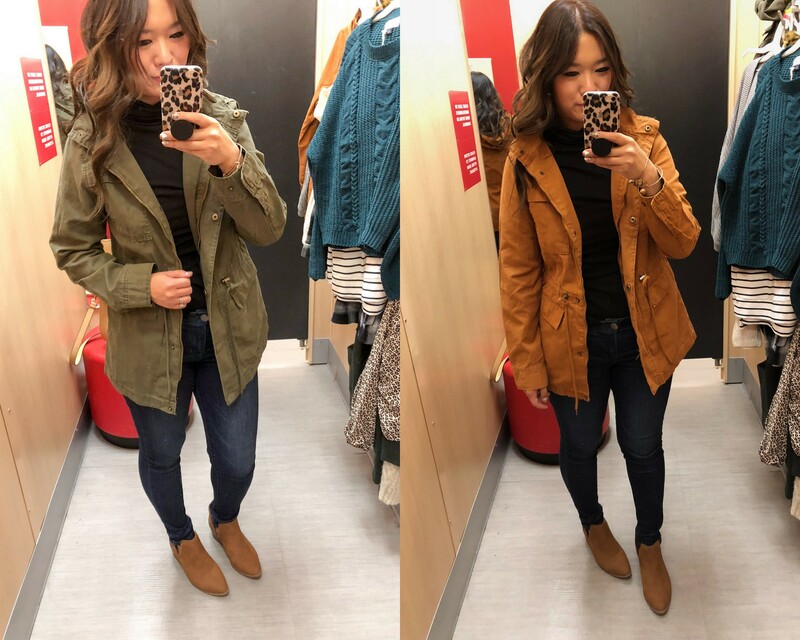 Target strikes again with some great Fall pieces… and to top it off, clothing, shoes, and accessories are 20% off with code SAVE20! I was able to try some of their new releases the other day and I’m so glad I did! Remember that this applies for men and kids also so stock up on their fall basics as well!! I’m wearing This cardigan is so cute! I am wearing a size small and it is a bit oversized but I love the look of it. The sleeves are a balloon style which I adore! 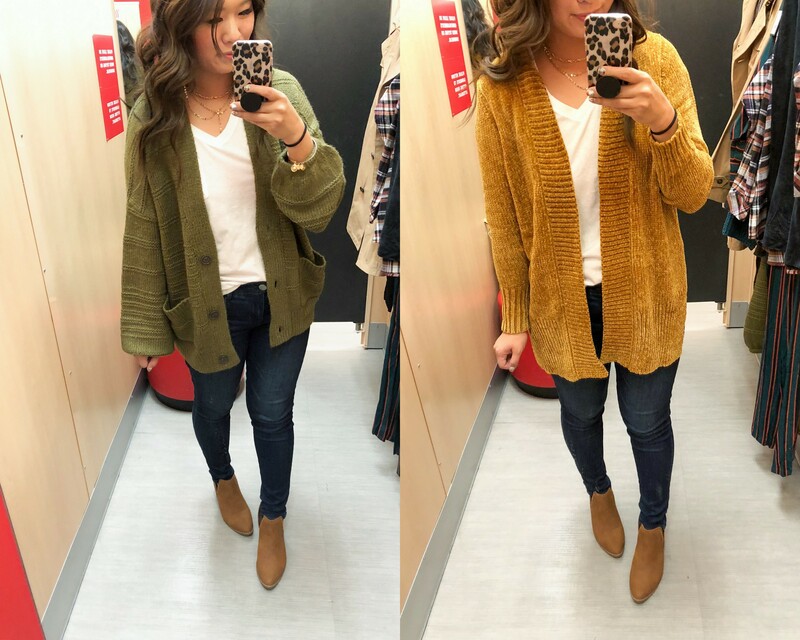 When I saw this yellow chenille cardigan, my first thought that it’s a good dupe for the Loft chenille cardigan (40% off with code FALLFEST) that I love and a lot of you did too! This one is just as soft as the Loft one but comes in different color options. 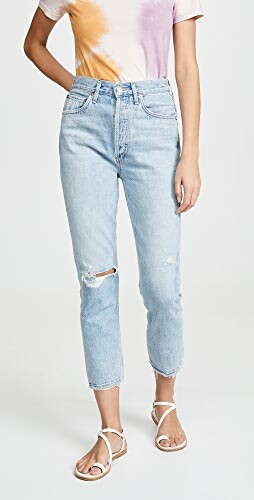 These are one of my favorite jeans but sadly, this one is sold out. There are other options in this same brand that is just as good! 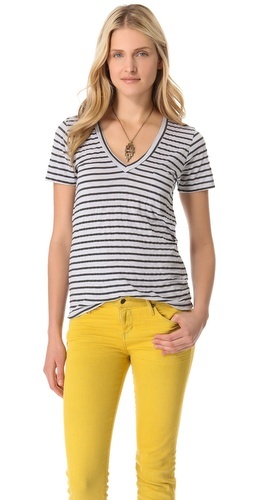 The striped cowl neck is hands down one of my favorite that I tried on! It’s long enough for leggings and can be dressed up or down! I really LOVE it tucked into the skirt for a work appropriate outfit. I was unsure how I felt about the pullover layered over but I love how it looks! I am obsessed with pullover and the colors that they’re offered in. I tried on both a small and medium. The medium is the perfect oversized fit that I love. With the small, it was a bit shorter so you would have to wear it with high waisted jeans. 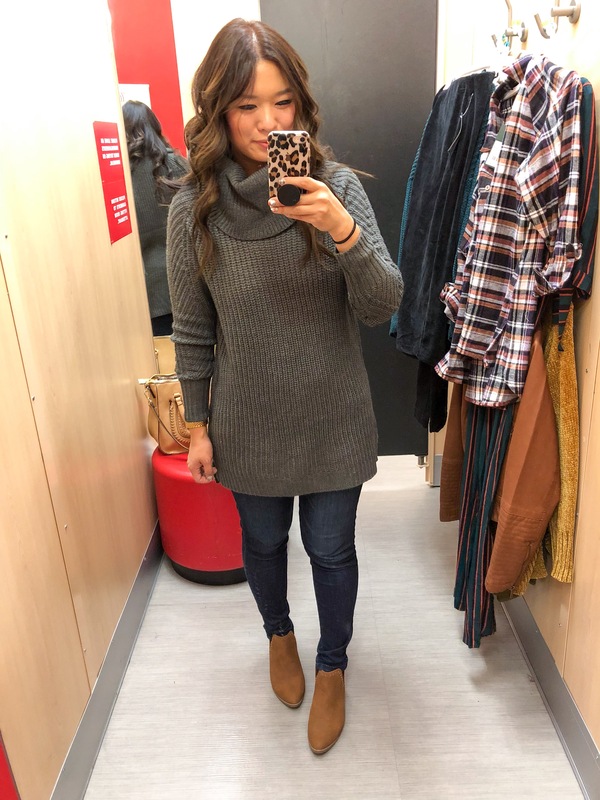 Everyone needs a basic black turtleneck and I love how this one has a 3/4 sleeves so it’ll be easier to layer. 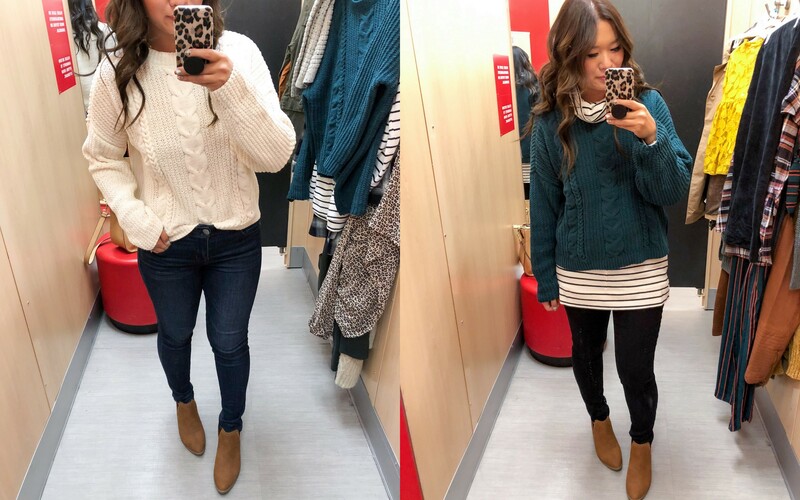 Target has been doing an amazing job with all their cardigans this season! The details in both the cable open cardigans are a nice touch. 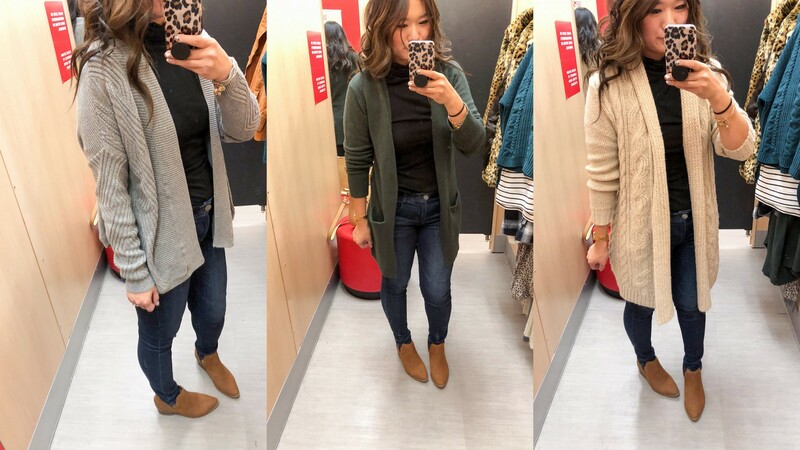 The cozy open cardigan reminds me so much of the Old Navy cardigan that I own in 3 colors. This pullover came home with me! It’s so cozy and comes in 7 colors! You know something is good when it’s selling out fast! 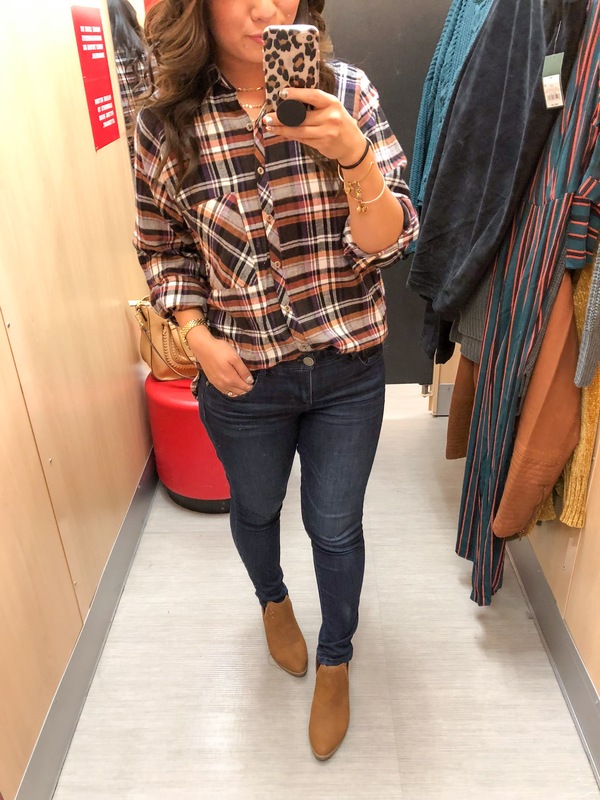 This plaid button down is a great dupe for the Madewell plaid one that you all loved! 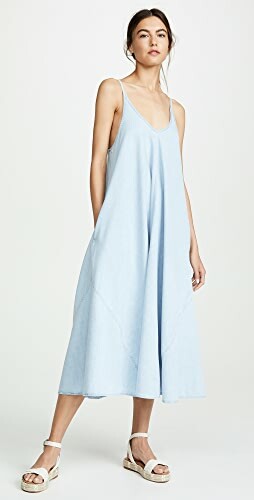 It was almost sold out on Madewell during their sale but I’m so glad I found this one. The colors are so great for fall! 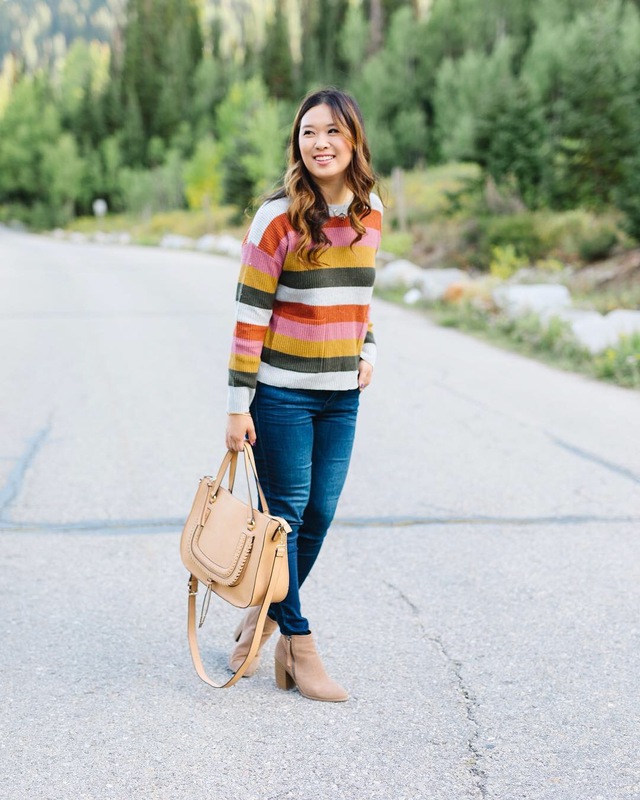 I love the texture and the specks of colors in this sweater! Also, the back has the cutest stitching detail that goes all the way down the back of the sweater. I also love that you can wear it off the shoulder as well, wear it with the Adella Free People bra!! 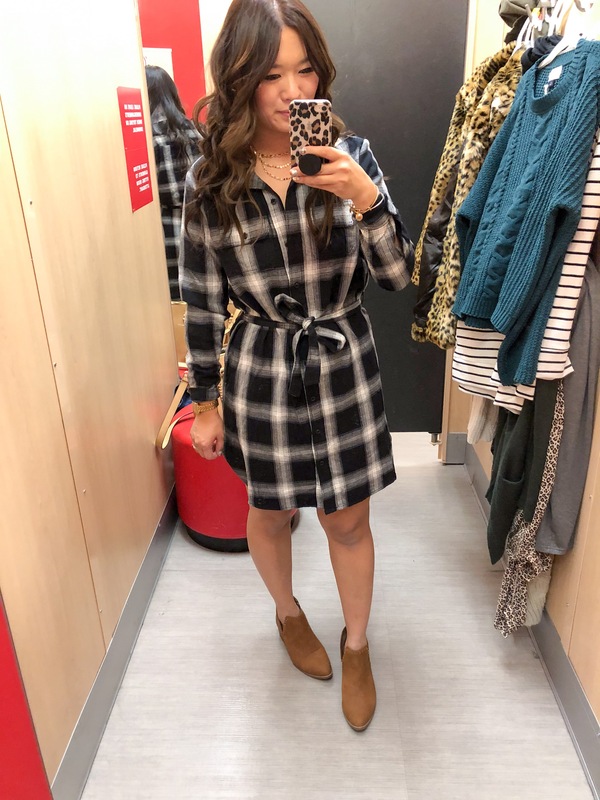 The length on this plaid dress is not too long or not too short. I also love that it has a tie so you can accentuate your curves! 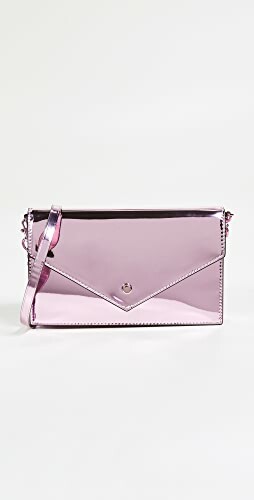 It does come in another color option that is just as cute! 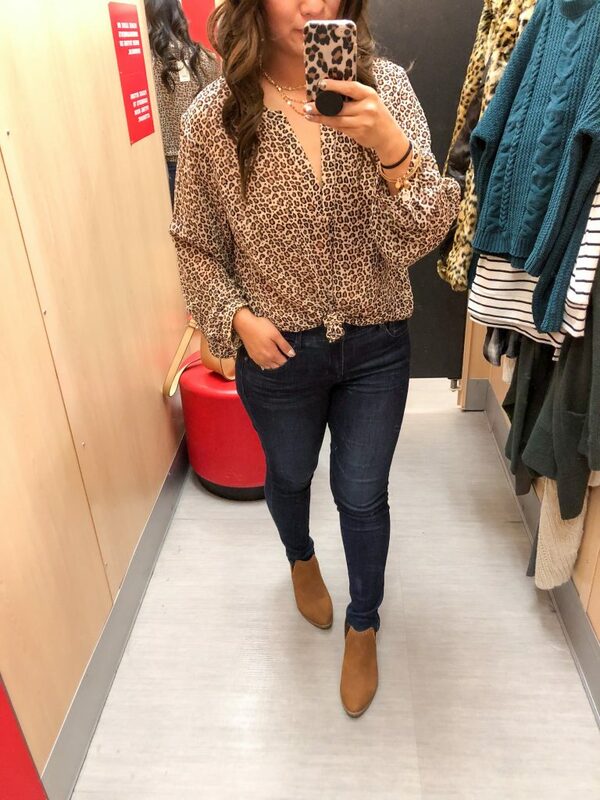 This top is a good top for work or a date night! Leopard print is trending so much now and my leopard loving heart is SO happy! I knotted it here only because it was so big but would look cute half tucked or tucked in a skirt and boots. 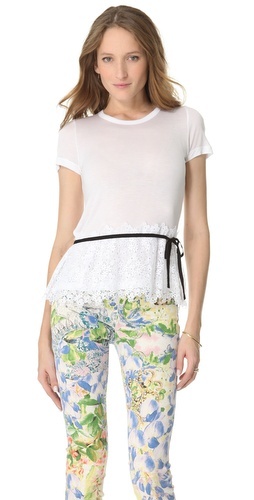 Please note that this top is a bit sheer so you will have to wear a cami underneath. 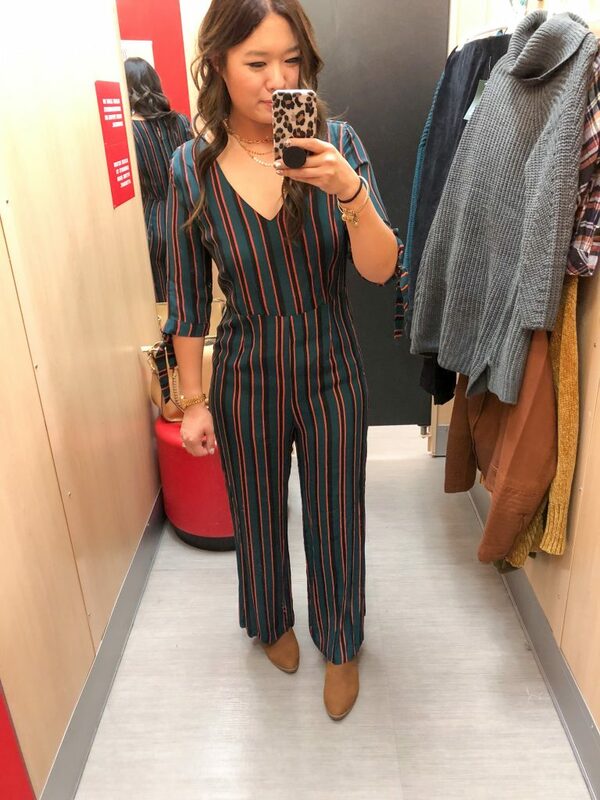 The colors of this jumpsuit caught my eye! I love the vertical stripes on it too! It did fit a bit loose in the stomach area but if I were to size down, I would definitely need to wear some Spanx! I feel like this may not be the best for curvier girls like me. 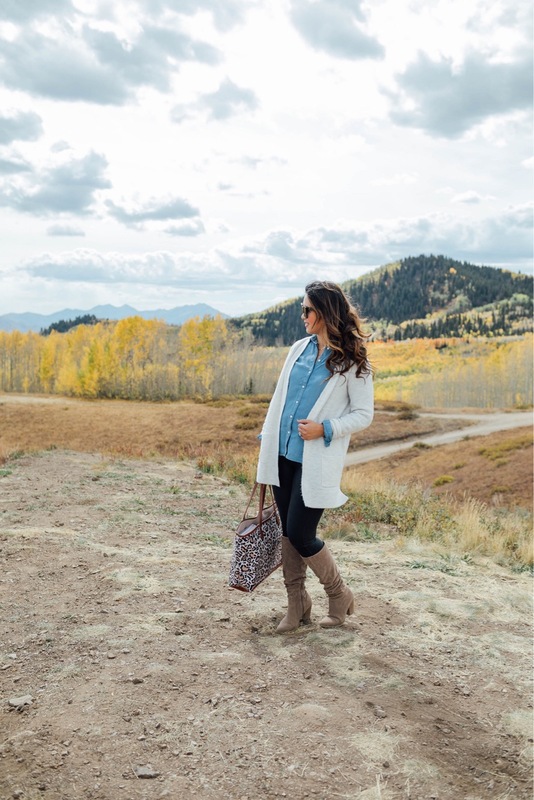 The color of this moto jacket is fall perfection! 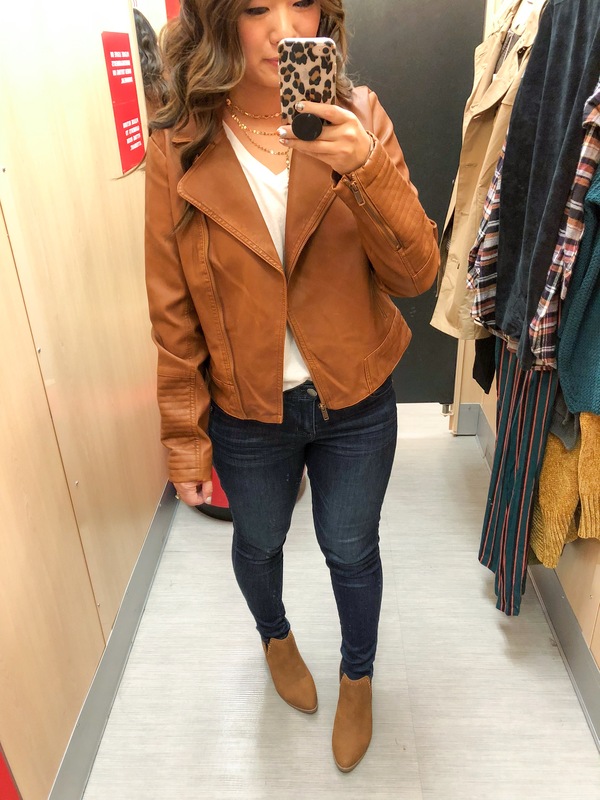 A moto jacket is such an easy jacket to throw on over any outfit and it’ll change the look of it! The sleeves are a bit long on this one but I would not size down in it. This utility jacket is another great throw on jacket. I love that it has the strings to cinch in the waist. It does run a bit big so I sized down to an XS. 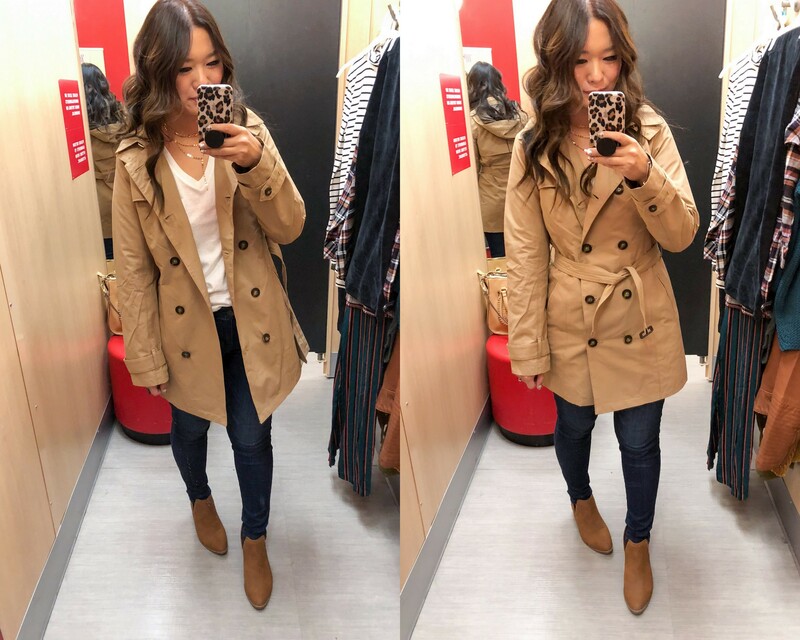 If you’re looking for a cute and affordable trench coat, this one is a great option. It comes with a belt but looks cute with or without it belted. It also comes in a black color option. These two are not online yet but I will update with the link once it is loaded onto the site!! And now for my favorite Target shoes that are part of the sale (well all shoes are)! If you’ve followed me for the past month or so, you know my love runs deep for these boots. They are such a good boot for a great price. This is a good time to stock up on these amazing slippers as gifts for the holidays (which is less than 80 days away!!!) 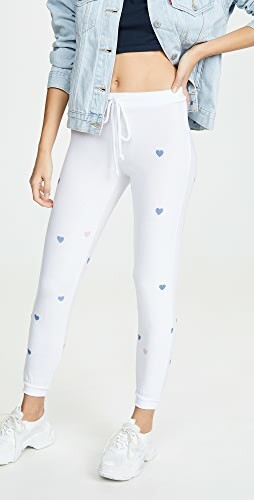 I own them in two colors because they’re that good. Read my moccasin slipper blog post reviewing a few other slipper options. These boots in in a few colors, have beautiful studs and are sleek! They are best for going out looks! 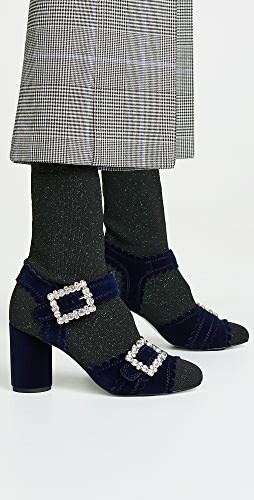 These loafers are super comfy and I love that I can slip them on to head out to daycare drop off or pickup – since I am usually running late, ha!! 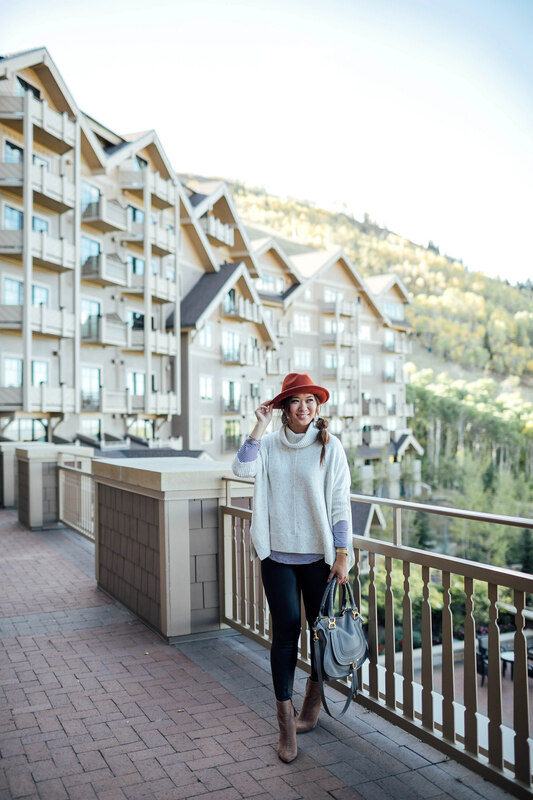 These little booties are Nordstrom sale dupes and so so comfy! 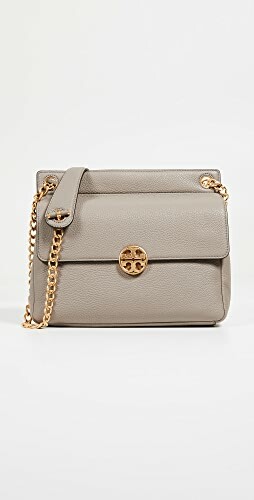 They are a great classic taupe color with some perforation detail on the back! I’m totally digging wedges right now and these bootie ones are super comfy! 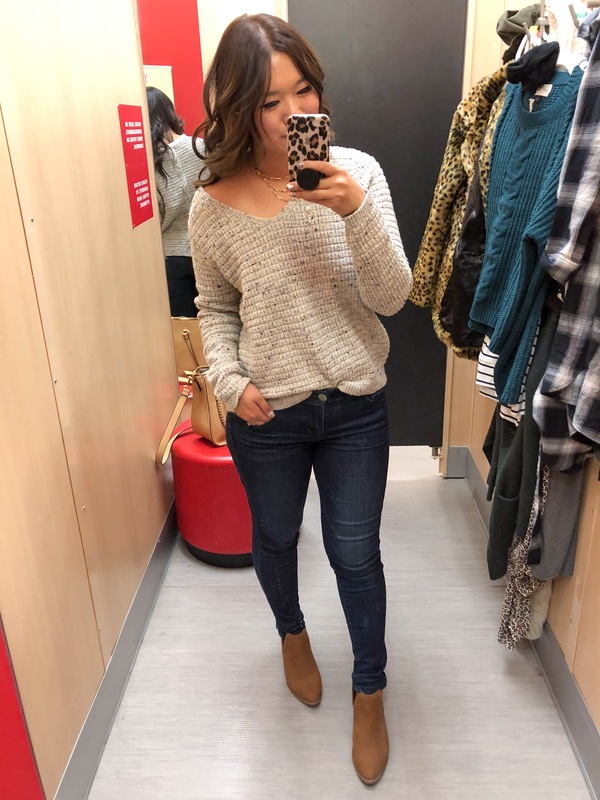 Shop all of the clothing items I tried on as well as a few other favorites below. This striped sweater and plaid poncho were also added to my cart! All of my favorite shoes are featured below! Do not miss out on the over the knee heeled boots and the over the knee flat boots too!! They are good!! 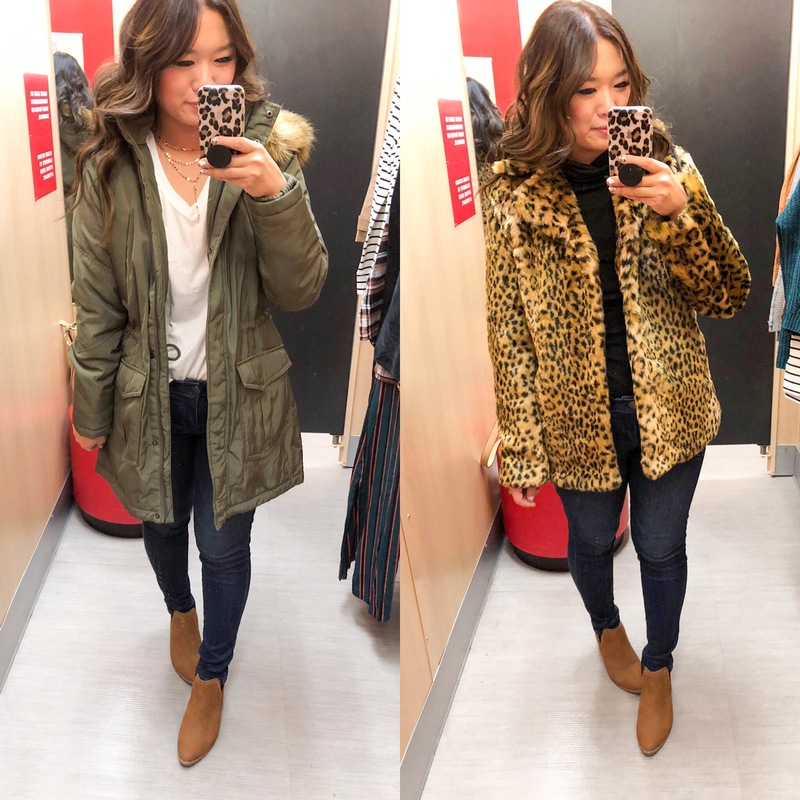 If you missed my try on, head on over to my Instagram stories or to my saved highlights under Target try on (in case my try on session expired)! Let me know below which was your favorite from this try on! Or if you own any of these items, tell me why you love them! If you choose to shop through my links, I make a small commission from your purchase. Thank you SO much for your support!!! 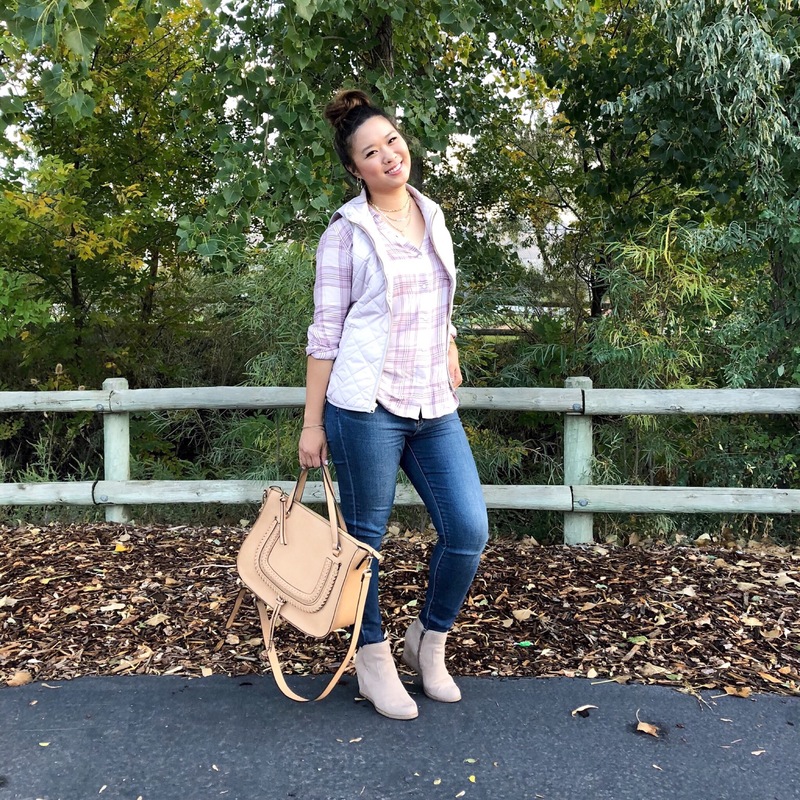 Previous Post Fall Family Outfit Ideas – Bold Color & Neutral Color Options! Shop Sweater Cardigans, Off Shoulder Black Dresses, Red Blouses, Sam Edelman Flats and more. Get this widget.